Polonia Open Tennis is an amateur tennis tournament held in South Florida (Winter Tournament) and New York City (Summer Swing Tournament). The original tournament was an annual winter event organized by a group of Polish-American athletes associated with the Riverdale Tennis Center of New York City. The origins of the tournament go back to 1998, when the current Tournament Director, Arthur Bobko, came forth with the idea to bring together Polish and Slavic people from all over the world to discover and enjoy tennis and the outdoor sporting lifestyle found all year round in Florida. Arthur gathered the support of a number of Florida sports fans. 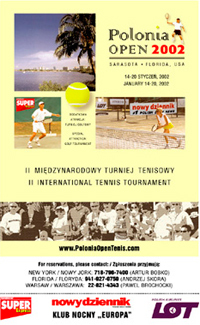 The first Polonia Open tournament was held in 2001 in Sarasota with 74 tennis players from the USA, Poland, Canada, England and Germany and a separate Golf event was part of the attraction of the tennis tournament. Pawel Gasior, current President of the PAGA, helped organize the first Golf tournament with 18 players. The event was a great success -- and Polonia Open was born. A future goal of the Tournament is to one day build a family-friendly sports center in Florida for the enjoyment of sports and outdoor activity all winter!